What is it like to go through a category 5 cyclone? I never thought I would know the answer to this question and that I would, along with my family and many other cassowary coasters, experience the strength of the wind in a house that shook as if it was Dorothy’s in the story of Wizard of Oz. 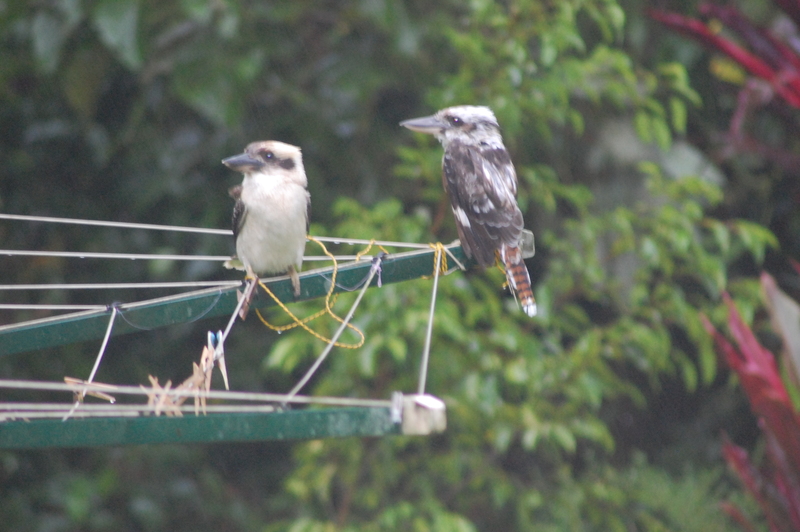 Two fat kookaburras sat on our clotheline in the light hours before the rain began to pick up and wind started to move the palms into a flag of wind directions. We heard their ironic laughter a few more times in the afternoon. Waiting – we seemed to wait for hours and hours. We just wanted it to be over. But we did not know how violent that storm was going to get. We couldn’t really see what it was doing in the dark, but boy could we hear it! Before the cyclone, everyone was bunkering down, and saying on facebook- ‘See you on the other side of YASI’ I don’t think they really knew just how challenging it was going to become. Some of us rang a few close friends to wish them luck. I rang three of my friends. One a mother to my daughter’s best friend and a couple of writer friends. It built slowly but then picked up momentum. We felt like a giant hand shook our house, harder, and harder and harder. It was just like contractions that strengthen and strengthen as the birth of the eye of the storm nears. Only the mother of this storm is feral wind gusts, that lift rooves, peel tin off roofs and sheds, it’s as if it was one tremendous tin opener that descended from the sky and went on a rampage through our homes. We felt like we were in a jumbo jet at times and our house was going to fly away. We could hear things banging and blowing, knocking into things. We heard the sound of the wind gremlins under the house, shifting and knocking things so that the cyclone hit us from the floor as well as above and sideways. We knew there were big trees all around us. A mango tree fell through our roof and splintered the ceiling which shot down in shards to the floor where we were sheltering. The bang was startling, and our dear bird Peep, was flying everywhere. We grabbed our guinea pigs, quail and Peep in each room change. It was a menagerie. Of course nothing like Sal’s little ark of animals but ours nevertheless. My dear husband, approached the cyclone scientificially, getting updates from his family on phone, who were consulting the bom site and he then used the data to calculate which room we should be in. 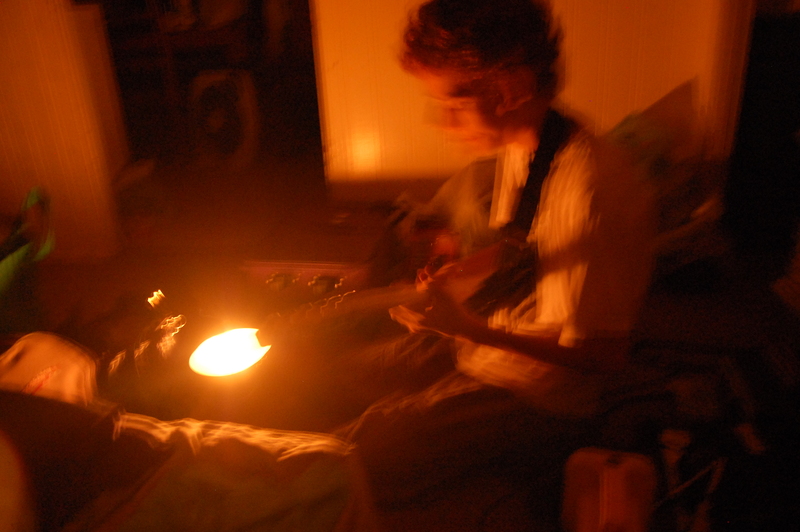 We had no electricity or iphones or that sort of stuff. He was calculating the direction of the the wind and moving us in rooms accordingly. He also asked for updates on the cricket – to calm himself and our youngest, who loves cricket. Our bathroom was not the best room for some of it and then it was according to his calculations. I was irritable, anxious, and felt the storm in every fibre of my being. I wanted to be somewhere else, but felt so protective of the kids. I squeezed my husband’s hand and hugged my kids. Why us, why now, why this storm? Later hubby was to tell me his family were so frightened for us they needed comfort in the cyclone we were going through. Comfort for potential loss of us and no way of being able to help us. We were at the mercy of nature. Yet I have been more scared, once when someone tried to break into our home and they knocked and banged on the doors and windows – a cyclone of human drunkeness or worse, intent on getting inside and hurling abuse at us. People are still more scary to me than cyclones. Our front doors open and we felt a funnel of wind blow the back window open. Hubby and eldest son kept going to close it. A window smashed in our bedroom but we weren’t in there, but we could hear it shatter. My eldest thought of getting a board and nailing it across the front door. So he and Dad did that in between the gusts. Going to the toilet was a real adventure. It was very spooky sounding in there, the worst sound in the house. Nowhere felt safe as the cyclone built and built its strength. We prayed, checked our cyclone kit, comforted our pets – Misty, Chocolate, Calico, Soot, and our youngest son who was terrified. He snuggled in his blanket, and hid under a desk. His sister had a nervous smile on her face. The science of the cyclone interested her too, ‘this is scary but this is brilliant’oh dear, I hope she doesn’t grow up to be a storm chaser. ‘Don’t smile’ yelled her terrified brother. We recorded our experience in photographs and sound bytes, ‘perhaps if we don’t survive our story will’- we thought. And then we ran in the eye of the storm, to the car, leaving behind our beloved pets barricaded in the bathroom. This was hard. I had to explain to the kids there was not time to grab the pets, and that the pets might make this sacrifice for the kids , and die in their place. I did not want to run, the advice says stay put, stay in the bathroom, but there’s a tree near our bathroom, tall and strong, ready to fall, and hubby felt let’s go, both on calculations and gut instincts ( this is a man who loves to wear odd socks to keep his students alert) ‘we’ll be safer up the street’ no time to argue, a decision to be made. I went with the scientist and we ran to the car. It’s dark and flooded in our laundry on the way to the car. Trust at times like these can be tested, disunity has the potential to destroy as much as the cyclone itself. We waded through it, kids and cyclone kit in tow. Hubby moved the debris from in front of the car for us to drive out. Thank God the car was alright to drive. We went through power lines, thank God the power was switched off – went out at 4pm. We arrived at the house of some neighbours, and they sheltered us in their laundry and someone gave us soft drinks and a matress. The kids dropped off to sleep. All squashed up! It felt so much safer in this low to ground stone brick? home. I didn’t sleep. I kept waiting for it to end. My children did, they sensed greater safety. Such precious sleep through the rest of the storm they had- and they were going to need that extra sleep for days of homlessness and uncertainty were about to follow. At one point in the second half of the storm though my youngest felt like ice, I checked his pulse to see if he was breathing and was frightened for a moment he had died of shock, but then the gentle rise of his chest told me otherwise. Some had an even greater menagerie of animals, some people had backpackers evacuees from lower lying areas with them. Some went to stay with family. Someones grandfather was out cleaning the garden before the cyclone. Hmm the gardens look like someone has just hurled everything randomly around in a violent fit of temper. We woke next day at our neighbours house and waited for the wind gusts to die down. We thought of our pets – time to go see them soon and check how they had fared in the bathroom the other place we would have stayed. We had made it through cyclone Yasi, but the story doesn’t end here. For we were soon to find that we were going to be searching for home. (c) June Perkins, all rights reserved on words and images. So glad to read your posting. I’ve been very concerned about you and your family. My prayers are still with you. Scary stuff June, but I’m glad you all got through it uninjured. i am glad we got through to Sue. It was a close call at times. So glad you got through the storm without injuries or worse. What a horrible experience it must have been. So glad you’re safe. Oh my gosh, June! As I was reading this I could feel my body tensing and fear building in my chest even though I know that you are OK. Must be a testament to your incredibly powerful talent for stringing words together! Is there anything that you need? I have been going through boxes in the garage and husband’s warehouse. It would be no problem to ship to you. kind of you to offer, but we are okay, so many people helping us out and we’ll get there. We managed to save a lot of our stuff, instruments and computers, mattresses, some people lost everything – some insured, and some not. We were not contents insured, but luckily saved heaps due to friends helping us move stuff before the house got too water logged. We are doing a big clearing out of stuff, it is very good for us. I heard about your story just yesterday and was so sad and terrified for you all. I looked at your children and hoped they were traveling okay. Luckily for us, we didn’t have to experience the trauma of what has been described as the most terrifying night for many lives. I have tears reading your story and pray that you are all okay. We have a distribution centre at Lower Tully which is constantly updated with bulk new and good quality supplies .. blundstone boots, towels, sheets, rope, tools, toys, clothes, underwear, household appliances. Please drop in anytime or alternatively, let me know what you need and I can put it aside for you. Cx and the Bof boys. I am so happy to hear from you. I’ve added you to my blog roll (: kids are doing well, and settling into our new home. What a day today with all the flooding in. Would love to catch up sometime – let us know when you are next visiting Tully, so many people so kindhearted !